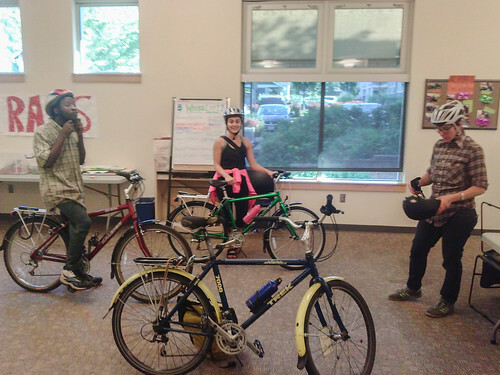 Earlier this year, the Community Cycling Center launched a pilot program with students from Rosemary Anderson High School (RAHS). RAHS is a community-based alternative high school for students who are not succeeding in the public school setting. RAHS’ efforts are proving successful with a current graduation rate of 90%. Our pilot program engages the students in hands-on, practical learning and critical thinking. The basic goals of the program are two-fold: 1) We teach bike mechanic skills in order for students to earn their very own bicycle. 2) Students also fulfill some of their high school graduation requirements by completing volunteer hours at New Columbia’s Bike Repair Hub. 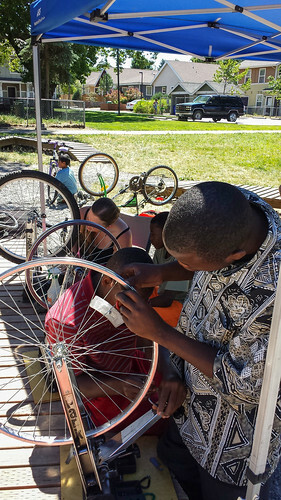 The students complete the basic bike maintenance training in the spring and receive additional trainings at the Bike Repair Hub over the summer to further refine and improve their skills. 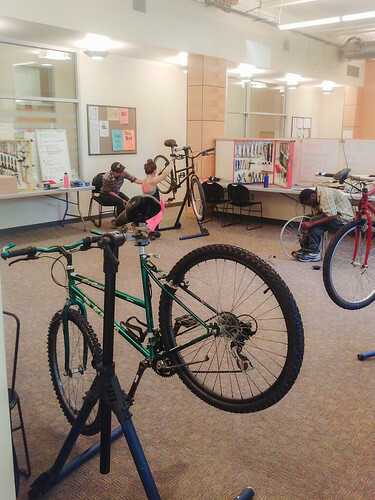 In addition to bike maintenance skills, students learn conflict resolution, basic customer service, and communication skills in a supportive environment. 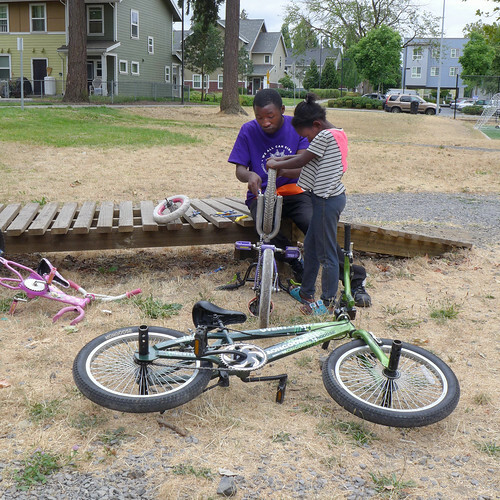 They accomplish this while completing repairs and engaging with their neighbors at the Bike Repair Hub. The pilot program’s success thus far has come through teaching kids with different learning styles. One student actually drew a picture of bicycle hub cones and bearings without ever seeing them; her drawing was based on the instructor’s description of what they do. Another student was a visual learner and needed to see bicycle parts first in order to understand. “Watching those moments of recognition when they put together how things work was exciting,” explains co-instructor Andrea Chiotti. The pilot program allows us to build relationships in New Columbia, which is really important. A lot of RAHS students see our instructors at the Bike Repair Hub. The students recognize the instructors from being in the classroom and feel more comfortable finding appropriate ways to plug into the program in the future. We hope to have more abundant and more consistent programs in the future that meet the needs of Rosemary Anderson High School students.